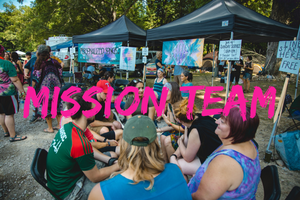 The Catalyst Ministries Team is returning to The Bonnaroo Music Festival (Manchester, TN) to partner with Love Reach, a collaborative mission to the Bonnaroo Music Festival. Last year over 500 found salvation in Christ through this initiative. Gospel encounters at Bonnaroo are wild and often marked by the power of the Holy Spirit on display through prophecy, healing and love as well as acts of service and mercy. This Mission Team experience is unique and sure to be a dynamic week. Team members will receive training via e-course prior to convening in Franklin, TN. While in Tennessee, we will commute each day from Franklin to Bonnaroo for ministry, followed by a weekend lake house retreat in East Tennessee where we will celebrate all that God has done. Join us June 10 - 16, 2019 for a week of mission, family and summer wildness!! Space is limited. Register now to save your spot! !